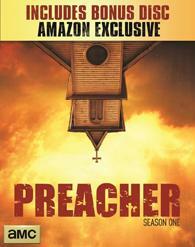 Based on the cult hit comic book series, Preacheris the edgy story of Jesse Custer (Dominic Cooper), a conflicted preacher in a small Texas town who is inhabited by a mysterious entity that allows him to develop a highly unconventional power. Jesse, along with his fearless sidekicks, Cassidy (Joseph Gilgun), an Irish vampire, and Tulip (Ruth Negga), a trained marksman, embark on a wild, dark journey that is unlike any other. Special Features:Deleted & Extended Scenes"The Unfilmable Pilot""The Stunts of Preacher"